Literary Rambles: Interview with Rane Anderson! A couple months ago I checked in with Rane Anderson of The Lit Express and a lot was happening. Since we'd last spoke, Rane had received a publishing contract for a couple middle grade novels with a small publisher and was gearing up to publish a YA novel for FREE on her group blog. Well, of course I had to poke around in her brain about all this, so here she is for an interview! The first installment of Who is Saint Giovanni? debuted this week and it's fantastic. You can find the summary here and the first chapter here (and wait impatiently with me for Monday, a.k.a next-installment day) but before you run off, the interview! Hi Rane! Can you start things off by telling us a little about yourself? Hi Casey & Natalie! Thanks for having me here on Literary Rambles! I’m pretty much your average reading and writing junkie. If I’m not doing one or the other, I’m thinking about doing it. The in-between times are filled with my other loves: traveling, hiking, camping, going to the movies, playing poker (hold ‘em style), and spending time with friends and family. You have a couple middle-grade novels coming out with TCM Publishing in 2012. Congratulations! What are the books about and how did you come to publish with TCM? I have done a substantial amount of freelance editing with TCM Publishing. The “TCM” stands for “Teacher Created Materials.” Until now, they have only published educational resources. Last July, I heard of their intent to start a fiction line, and I jumped at the opportunity by sending in writing samples. The Philosopher is a gritty historical adventure featuring a boy who becomes Benjamin Franklin’s assistant. On the Moon is a sci-fi adventure about a brother and sister traveling through different dimensions to rescue their scientist mother. Both sound fantastic! You'll have to let us know when and where we can get our hands on them. Now, you also have a YA paranormal romance novel you’re publishing serially on your blog for free. Can you tell us a bit about Who is Saint Giovanni? Who is Saint Giovanni ? is about a troubled girl, seventeen-year-old Emily Edwards, who awakens the morning after a near death experience to discover an X carved between her eyes. It’s painless, bloodless, and she has no clue how it got there. No one else seems to see it. As if that’s not bad enough, Emily’s senses are freakishly sharper, like she has been living, until then, a little deaf, a little blind, and without taste buds. Desperate for answers, Emily has to trust the one person in Italy she promised to avoid. Giovanni. Very intriguing summary. I have questions already! Why did you decide to publish WiSG? on your blog? My thoughts on getting published have changed over the last year. In the old days, I wouldn’t have considered giving away my novel for free. Time is money, right? And if it’s offered for free, how does that help my career? I want to be clear about this. I am very serious about my ambition to become a successful author. But I’ve learned that we writers shouldn’t cling to our work, thinking, “What will happen if this one doesn’t make it?” I’ve been there. I’ve thought that. But I take comfort in knowing, with 100% certainty, that I will always write another novel. And after that one, I’ll write another. There is no end to the journey. After I came to that conclusion, and after starting another project I’m super excited about, I decided to post Who is Saint Giovanni? on The Lit Express so others can enjoy it. What do I have to lose? Great answer, Rane. I love your thoughts and attitude on this! Do you plan to publish WiSG? via Kindle Books or similar in the future? I hadn’t planned to at first, but I’ve decided I will after posting it on my blog for a few months. Even after it’s for sale (for .99 cents), I’ll continue to post it for free on my blog. Of course, I wouldn’t mind making a little money, but I don’t expect to become the next Amanda Hocking. If it happens—wow—if it doesn’t, I’m on to the next order of business! 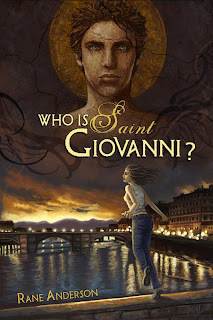 The cover for Who is Saint Giovanni? is gorgeous!! I know from the cover story on The Lit Express that it was designed by Ashley Stewart, but I’d love to hear how you came to work with her and what your plans are for other illustrations. Back in February, I posted an ad on conceptart.org explaining my plans to publish WiSG? on my blog. I wasn’t even thinking about a book cover at the time! In my opinion, a big chunk of text on a website isn’t very appealing to look at. 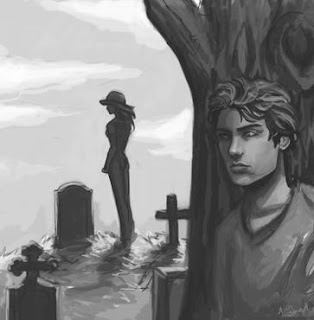 My plan is to begin each post with a black and white illustration depicting a scene from the posted chapter. There will be a new illustration every week! Over 30 people applied for the job, and Ashley was one of them. I fell in LOVE with the art on her website right away! (ashleystewart-art.com) She has a great career ahead of her! Do you think you’ll be able to reach many teens with your serial novel given the publishing format? How can readers help spread the word? Ask me this question in a month (lol). I really don’t know what to expect at this point. I have met several book bloggers (teens included) who are really excited to start reading! And the best way to spread the word starts with you, Casey! If you read WiSG? and like it, you will tell your friends. If they read it and like it, they’ll tell their other friends. People who become genuine fans of something will not hesitate to recommend it! If the rest is anything like the preface and first chapter, you can bet I'll be spreading the word! Where can readers get the latest and greatest on you and your books? Thank you, Rane, for taking the time to answer the call of my curiosity. I can't wait for the next installment of Who is Saint Giovanni? and wish you much success with all your novels in the coming months! Readers, do you have any questions for Rane? 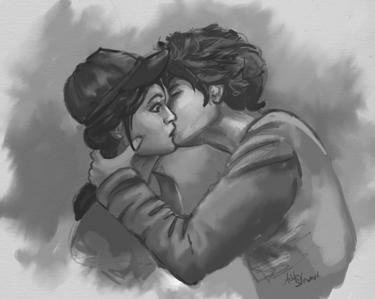 If these tasty illustrations aren't enough to send you over to read the first chapter, perhaps the book trailer will? I love those illustrations. Good luck with posting your book in serial on your blog, Rane. I hope you attract lots of readers. Congrats Rane. Do let us know when your other books will be published. I'd love to read On the Moon. Besides word of mouth, do you have any marketing plans to spread the word on Who is Saint Giovanni? I like the way this author thinks! Will definitely take a peek at her work. Thanks for the interview! @Natalie: What a tough question! I suppose it shouldn't be. I should have an elaborate plan typed up highlighting each and every step I'm going to take, but I don't. I have some great ideas that are going to take really hard work and lots of time, but I'm not sure how they will work. I honestly believe that word of mouth is powerful enough to spread the word. I'm not looking for overnight success. I'm in this for the long haul...it could take 5 years!! :) On the smaller side: I plan on setting a blog tour in motion! And I'm aiming to branch out into all forms of social media. I'm making youtube videos. I have a facebook page. The real question is: HOW DO I REACH TEENS, which is my target market? I can reach teens in their schools and libraries. So I'm working on a plan that involves that:) I'll get back to you once that is set into motion!! @Anita: *blushing* Why, thank you. :) It's the only way I CAN think and still continue down this road as a writer. @Heather: and I appreciate you stopping by the blog and reading the first installment and commenting! Great interview. It's nice to learn about Rane. Rane, I wish you luck on all of these books! I'll keep a look out for On the Moon--I'm always wanting more middle grade sci fi!